I have during my college days used XMLHttpRequest object and its equivalent in Microsoft world to make Ajax calls and those Ajax calls were to the URL within the same domain. But with the advent of Webservices and whole lot of mashups being developed, Ajax calls are not restricted to same domain but the cut acorss different domains. When this cutting across domain boundaries happens making Ajax calls using XMLHttpRequest fails due to security enforcements implemened by the browsers. That’s when the idea of JSON-P i.e JSON with Padding came up. There have been a lot of concerns about how secure using JSONP is, but I dont want to get into those discussions as that is not the main motive of this post. 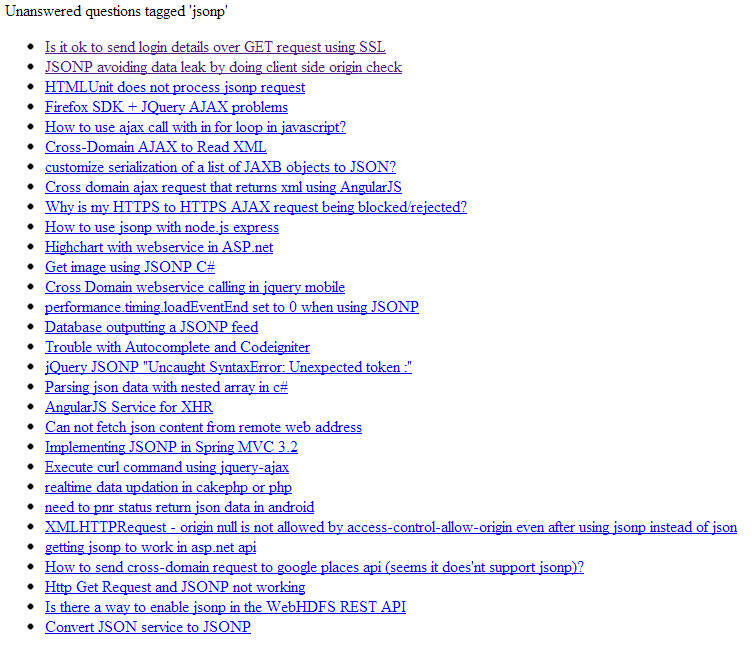 Now going forward, let me show JSONP in action using a simple example. //Appending the script tag to the head element. //This triggers a JSONP call to get the data. 2. invokes the callback by pasing the JSON object. The animalSays method retrieves the JSON object and then populates the HTML with the data in the JSON object. Lets look at a more better example. Part-1: Loading the URL which contains the data and the function invocation. //The URL is loaded by including it in the script tag and adding to the DOM. If you have any issues in running any of the sample code shown in the post above, please get in touch via the comments below. Thanks for suggesting. I will check it out. Hello Sanaulla would you please suggest me any good book for JASON.